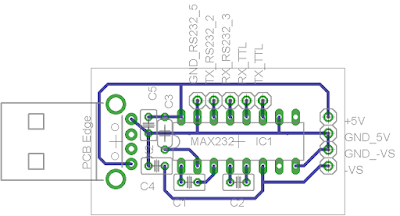 I often use the MAX232 as a RS232 driver between PC and micro controllers. It is annoying to setup the components on a bread board (five capacitors and all the wiring). To avoid the mess and to save some time during tinkering, I designed this little board. It is powered by USB. Just plug it in and connect your wires to the COM port and the µC. 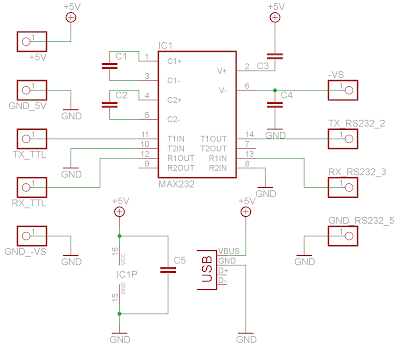 USB plugs are easy available power supplies for logic circuitry. They supply adequate constant 5 volts up to 500mA. I often use them for my projects. I spend some extra pins for 5V, to power some bread boards, some GNDs and the -Vs pin of the MAX232 for negative voltages. The negative voltage is sometimes useful as reference voltage. I needed negative voltage for the contrast of a LCD in a different project. I used Eagle3D to render the board. It was the first time I've ever used it and I'm really satisfied with the result. I think I'll use this for all my projects now. I finally used 90° bent pin connectors for soldering. I put a coin next to it to visualize the dimensions. ...damn I need a better camera. Sorry for the bad quality.